The initial treatment will take 1 hour, which includes taking your medical history, questions about your diet, digestion, sleep patterns and current state of health. Follow up treatments last 45 mins. A course of 4 to 6 treatments is recommended, although it is not uncommon to see improvements and changes as early as the 1st or 2nd treatment. It is helpful to have follow-up treatments even after the condition has been resolved to maintain overall wellbeing. Caroline uses both Traditional Chinese Medicine and Five Element techniques of diagnosis during treatment that looks a condition from both a Chinese medicine and constitutional stand point. Clients should wear loose comfortable clothing as acupuncture points are all over the body and depending on the condition being treated arms, legs, stomach/chest and back may need to be accessed. Chinese Medicine can treat a wide range of conditions or for maintenance of general health and wellbeing. Caroline has particular interest in helping people with symptoms related to the following: hypertension, diabetes, menopause, thyroid, sickle cell, MS, stroke, old age, puberty, pain management, mental health & wellbeing including poor sleep, stress, anxiety, PTSD and bereavement. Some of my clients have provided testimonials to give an idea of the conditions I have helped clients with. Acupuncture or at least Chinese Medicine is not all about needles! There are a number of other techniques that can be used during treatment. Cupping, Gua Sha among others are all utilised by me during treatment. To find out more about these techniques click on the text links. Cosmetic facial acupuncture also known as micro-needling is a natural alternative to cosmetic surgery and fillers such as Botox. These treatments are aimed at revitalisation the face using the bodies own natural collagen resources and take 90-105 mins. Treatment includes the use of acuRegen® products combining beauty therapy and acupuncture. acuRegen® products are specifically designed to work alongside the face and body acupuncture points. 6-12 treatments are encouraged to see lasting results, with follow up treatments recommended on a monthly/bi-monthly basis. Clients can expect to see a reduction in the depth and appearance of wrinkles, reduction in puffiness and bloating around the eyes, lift and toning of sagging skin, improved complexion, tightening of pores amongst other things. As the treatment includes body acupuncture points, clients can often experience improvements in their overall health including improved sleep and energy levels. 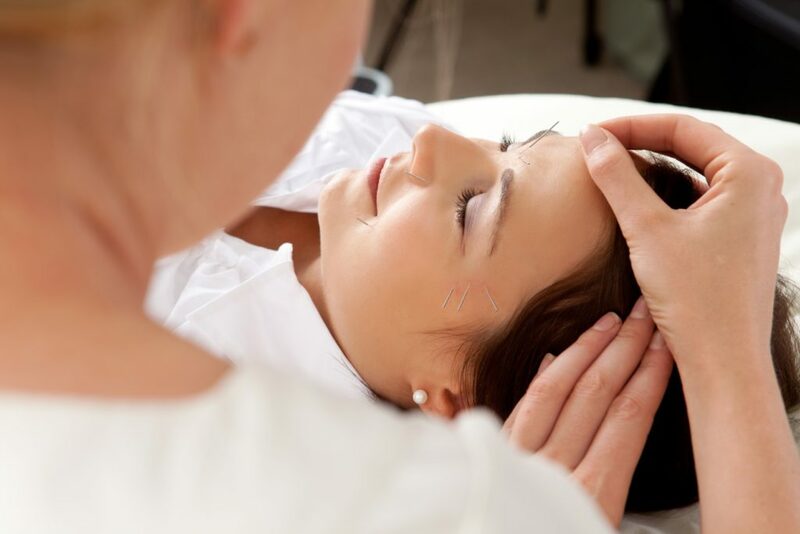 Clients who suffer with regular migraines – it is advised to treat the headaches/migraines with a course of acupuncture first. The ear is a microsystem of the body and many conditions can be treated by using needles and ear seeds. This is a great introduction to acupuncture and does not require clients to remove clothing which appeals to some clients. Treatment involves insert needles into the surface of the ear. Treatments are usually between 30-50mins. Why not get together with a group of friends/family or work colleagues and try a group NADA Treatment. NADA treatments involve placing up to 5 needles on the surface of the ear and are provided in a seated group setting. Treatments are non-diagnostic so no need for a long history taking everyone gets the same! NADA treatments are usually 20-40mins and are a great way to try acupuncture with a group of people that you know and are an excellent stress buster! Shonishin is a Japanese style of acupuncture using very few needles or non invasive tools to stimulate acupuncture points in babies and children. Prices and timings are the same as for regular acupuncture treatments. NB. A list of private healthcare insurers who cover all or part of the cost of acupuncture treatment can be found on the British Acupuncture Council’s website. If you ready to experience the benefits of Acupuncture call or book your first session.